Mix together the cream, cayenne, salt, cilantro and the dissolved cornstarch in a 2-quart saucepan over medium heat. Cook and stir until thickened, about 10 to 15 minutes. Preheat the oven to 350F. Melt the butter in a skillet over medium heat. Add the onions and mushrooms, and sauté until the onions are transparent. Remove from heat and set aside. Squeeze the excess water out of the cooked spinach. Place the spinach, bread crumbs, white pepper, nutmeg, chili powder and egg in a food processor and pulse until blended thoroughly; season with salt. Transfer the spinach mixture to a large mixing bowl and stir in the reserved onion-mushroom mixture and 1 cup of the cheese. Spoon about ¼ cup of the filling onto each flour tortilla, roll up and place seam side down in a 9 x 13-inch baking dish. 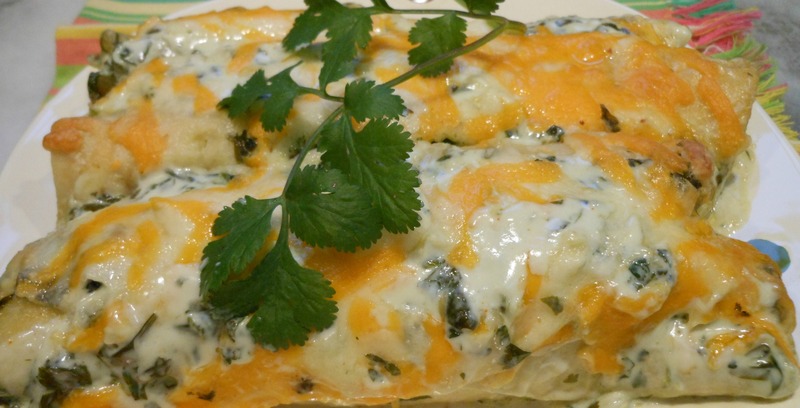 Pour the Cilantro Cream Sauce evenly over the enchiladas and sprinkle with the remaining 1 cup of cheese. Bake for 30 minutes or until brown and bubbly. Note: For a special presentation, line the center of the tortillas with fresh spinach leaves before filling and rolling them and garnish with *Spicy Sauce. Posted in Recipe and tagged Cilantro, garden recipe, Herbs to Grow and Use in Dallas. Bookmark the permalink. These were WONDERFUL!! Thank you for sharing the recipe- any chance you’ll post the Cilantro Shooters? Ruby, I will have that ready to post in the morning-so appreciate your encouraging words. Feeding 101 at the garden was quite a feat, so glad you all liked everything! I love it when you post recipes caused know they have been tried and true! The luncheon was perfect! You guys out did yourselves! Teamwork and a beautiful day!